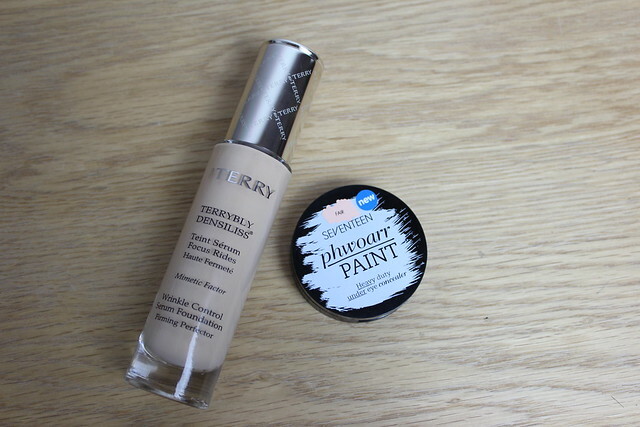 This is a slightly different spend vs save post today as it’s two complexion products that are on opposite ends of the price scale – with the rather spendy By Terry on one end and the cheap and cheerful Seventeen on the other end… but together they actually make a great foundation & concealer combo. I already talked about the By Terry Densiliss Foundation and how it is a bloody awesome foundation – but yes, it is a pricey one. At £75 Terrybly Densiliss is without a doubt the most expensive single item of make-up in my collection. But, I have to say – it really is second to none in terms of quality. It feels lovely on the skin and leaves it feeling on a perfect balance between hydrated and glowing and not too shiny. What I have been doing…perhaps in a subconscious effort to balance out the old make-up bag girly-maths style is using the Seventeen Phwoarr Paint heavy duty under eye concealer. This is a bit of a funny one, as you think heavy duty you thing thick, heavy to wear and intense pigment. But this is actually quite creamy, it is highly pigmented but doesn’t need a thick layer to cover things up. What I tend to do is apply this lightly to areas I want to conceal – primarily under the eyes, but have also used around the nose and on blemishes. It doesn’t add a highlight in the way other typical under-eye creams do – so can multi-task. Then I add the foundation only where I need it (got to make it last!) which is usually lightly under the eyes to keep the area feeling hydrated and then on the t-zone, focussing on the chin and nose. I don’t tend to go heavy on the cheeks as I prefer a natural finish overall. All together, this cheap and cheerful plus a bit of a spendy combo really does create a lovely balanced finish. The peachyness of the concealer is great for correcting dark circles, then the foundation is a lovely colour match for my pale skin (Shade 4 Natural Beige). The only addition I make if I want them to last even better than they do anyway is a dusting of the By Terry Hydra Powder – amazing stuff if you want to mattify, but also keep hydrated. I love the Seventeen concealer, definitely one of the better high street concealers I’ve tried! The foundation sounds so good! x It’s a shame they only have light shades in the concealer! Love SEVENTEEN’s Phwoarr Paint it’s one of my favourite concealers. It’s a good one isn’t it – good coverage without feeling too heavy. Impressive stuff. Thanks for this post! I’ve been trying to get hold of this Seventeen concealer for a while now but Fair is sold out online and all the ones in my local Boots had massive finger marks in. Grr! It looks great for covering dark circles and mine are so horrible I need all the help I can get!